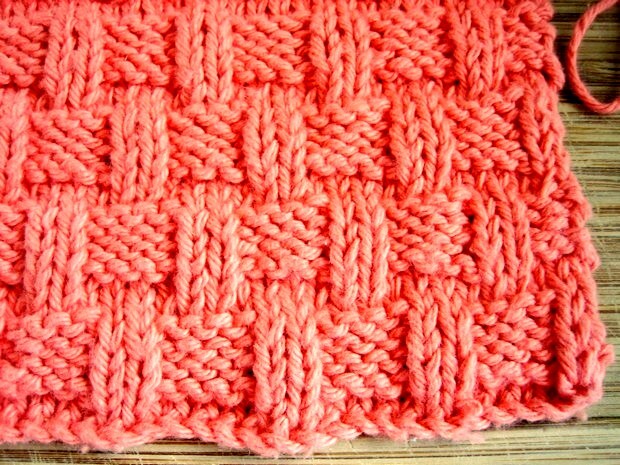 There are many variations of basket weave knitting stitch. 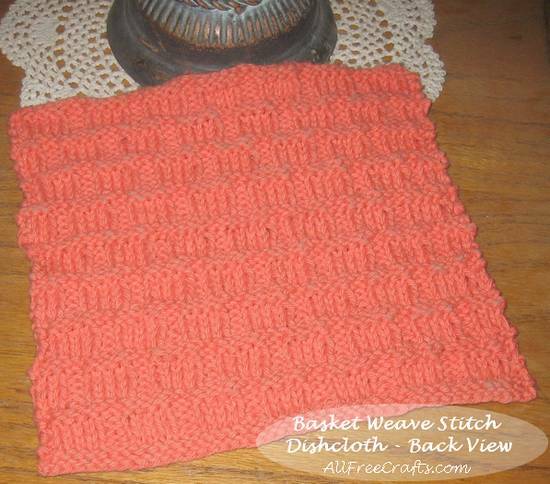 This version is a nice choice if you like a sturdy dishcloth with a woven texture which soaks up water or other liquid spills easily and quickly. Because of the stretchy bias, this cloth also folds nicely in the palm of your hand and wrings out really well. 1 pair of knitting needles in U.K. size 8, U.S. size 6, or 4mm. 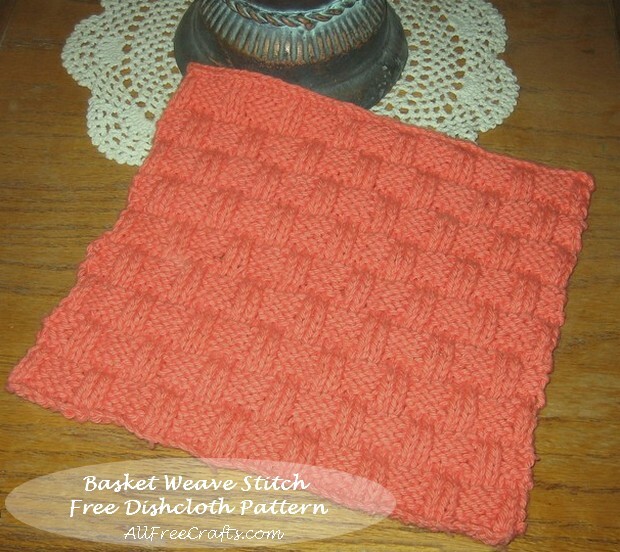 Back view of the basket weave stitch dishcloth. Cast on 44 stitches for a 9 inch dishcloth. (This works out to seven repetitions of the pattern; for a smaller, or larger, dishcloth use multiples of 6, plus 2 stitches). 1st row: (Right side). Knit. 3rd row: K2, *P4, K2. Repeat from * to end of row. 4th row: P2, *K4, P2. Repeat from * to end of row. 5th and 6th rows: Repeat 3rd and 4th rows. 9th row: P3, *K2, P4. Repeat from * to last 5 stitches. K2, P3. 10th row: K3, *P2, K4. Repeat from * to last 5 stitches. P2, P3. 11th and 12th row: Repeat 9th and 10th rows. These 12 rows make the first complete basket weave pattern. I did four repetitions of the 12 rows, then I repeated the first 8 rows to finish, which means that my last two rows were a knit row, followed by a purl row, before casting off. This gave me a nice 9 inch square dishcloth. Your knitting gauge may be the same, or different, to mine. Next to last row: Knit.